Here's a movie that has audiences extremely divided. It is definitely a case of "You either love it, or you hate it;" the film's supporters even incorrectly state that it's really about "You either get it, or you don't". Well, I get it, but I still hate it. In fact, it is impossible NOT to get it. 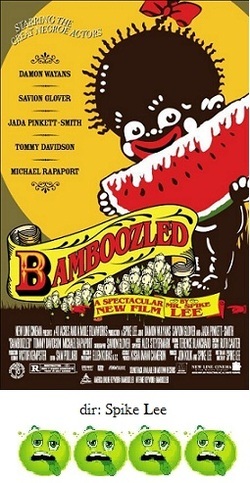 Director Spike Lee's Bamboozled is, according to him and the film itself, a racial satire. I get it. However, it is one of the most heavy-handed, obvious, ham-fisted, crass and in-your-face attempts at satire ever put to film. The premise of Bamboozled is an extremely intriguing one, sort of, but becomes less intriguing and more confounding the more you think about it. The film stars Damon Wayans as Pierre Delacroix, an ivy-leaguer who is working as a writer for the CBN network. His boss, Michael Rappaport, chastizes him for not being able to create a television show that is "black enough", claiming that he has lost his African-American ties by saying things like "I have a black wife and 2 bi-racial kids, brother man, I'm blacker than you." Wayans decides he wants out of his contract with the network and decides to write the most racially offensive show he can possibly come up with so he will be fired. None of it works out as he hopes, though. With the help of his assistant, Jada Pinkett Smith, he hires two homeless men, Tommy Davidson and Savion Glover, and creates a throwback to the 1940s black-face minstrel shows, called "Man-Tan's New Millenium Minstrel Show". Glover will play Man-Tan, Davidson will be his sidekick named Sleep'n'Eat, and along with several other actors, all embodying hurtful stereotypes, they have their adventures in a watermelon patch. The other catch, all of the performers will wear black-face. And of course, the show is an overnight success. Wayans becomes a wealthy powerful man in the process. And everything, as it must, ends violently and tragically (if it didn't it wouldn't be a Spike Lee movie). Ok, now that I've summed up the story, let me just say that the whole premise is just a load of crap. I just want to go to Spike and say, "Spike, I get it already." Lee is trying to make a point about how current network series aimed at black audiences are really just updated minstrel shows in and of themselves. And occasionally, you can see that this is what he is doing. The problem is the suffocating obviousness of his approach, and the lack of realism involved. Satire can only truly work with a subtle hand. The very definition cries out for being sly and subversive, or at the very least clever and witty. Bamboozled is none of these things; it is satire with a sledgehammer. Beating you across the head with its themes to make sure you "get it". I also like my satire with a grain of believability too, which Bamboozled totally lacks. First, there is no way any writer would come up with the idea for "Man-Tan", secondly, no executive would listen to the pitch and say "That's a great idea! ", and no network would look at the show's pilot and order up a season, and if somehow that show got on the air, there is no way it would become a ratings hit. "Man-Tan" the show itself, is an ugly, and bitter throwback to a different era. I know Spike is saying that the era may be different, but the themes are just the same, but by forcing the issue with such a grotesque and obvious show in order to make his point, and going so far as to have the black cast wear black-face, he attempts to force-feed it to the audience. Needless to say, there will be lots of spitting-up. Apart from all of that, the film itself is not even well made. The hand-held camera work is shoddy, the editing is an example of excessive and pointless overkill, the script rips off elements from better films, like Network, and the acting is, for the most part, wretched. Jada Pinkett Smith and Tommy Davidson come off the best by being able to create actual three-dimensional characters with no help from the script. Michael Rappaport is his usual noxious, unpleasant self, Savion Glover is so flat and non-existent he almost disappears, and then we come to Damon Wayans.....What can I say, except that Wayans has easily given the single worst performance by anyone in any film in 2000. It really defies description. He gives his character a strange accent you can't pinpoint, over-enunciates every single syllable until it screams with bizarre inflections, overuses his hands in a forced manner and....I just can't go on. It's just dreadful, insulting work. If you are looking for an intelligent, thought-provoking satire about race and television, Bamboozled is not it. However, if you like your sermons served in movie form, then this is your cup of tea. As for me, yes, I get it! You hear me? I get it!! !